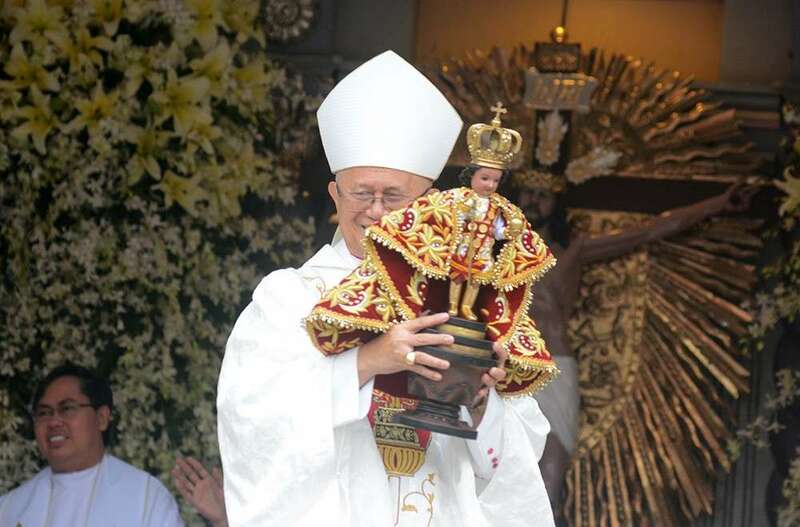 CEBU Archbishop Jose Palma encouraged the faithful to remain hopeful despite falling into sin at times, saying the child Jesus is a humble and loving God. Palma officiated the Pontifical Mass at the Basilica Minore del Sto. Niño Pilgrim Center early Sunday morning of the 454th Feast day of Señor Sto. Niño. “Mga hinigugma, magmalipayon kita. Magmapasalamaton kita kay tungod niining gasa sa Diyos. Para nato, dili kita takos. Pero alang kang Snr. Sto. Niño, matod pa sa ikaduhang pagbasa, diha sa atong pagtuo nahimo kitang’ mga anak sa Diyos, nahimo kitang usa ka banay (To all loved ones, let’s be joyful. Let’s be thankful for God’s gift. We may feel unworthy. But for the Senior Sto. Niño, as the second reading says, in our faith we become children of God, we become one family),” he said in his homily. He also called on the devotees to remain humble and be of service to others. “Ang tawong malipayon, ang tawong mapasalamaton, tawong mapaubsanon. Bisan kita dili takos, ang Diyos nahigugma nato, ug tungod niini sa kasing-kasing nga mapaubsanon makaingon kita, salamat sa Diyos (A person who is happy, a person who is thankful, humble. Even if we’re unworthy, God loves us, and because of that we must be humble and thankful to Him),” he added. He said that an invitation was sent to Pope Francis, the Holy Father, to attend the 500th anniversary of Christianity in the Philippines in 2021. “Let’s pray that the Pope will come here,” said Palma. 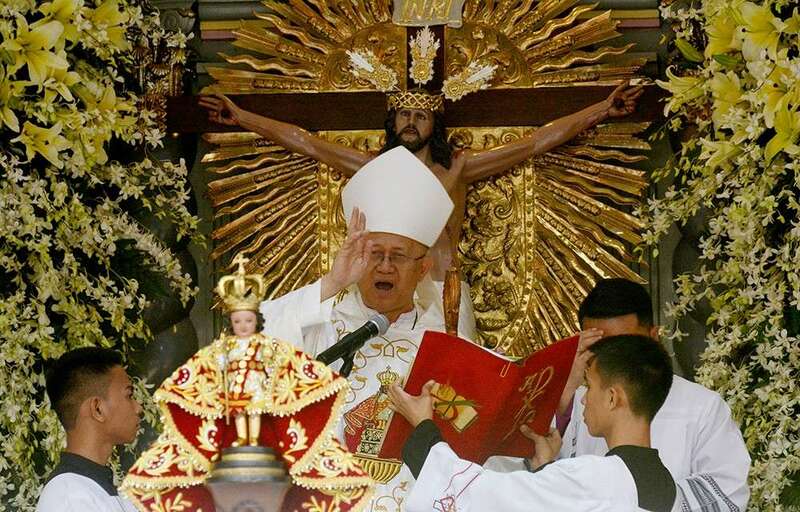 The Catholic Bishops Conference of the Philippines (CBCP), in a pastoral letter, launched in 2013 a “nine-year journey of Evangelization” toward the 500th anniversary of the Christianization of the Philippines in 2021 with different themes each year. A crowd estimate of one million as of 6 a.m. attended the Pontifical Mass, according to the Multi-Agency Coordinating Center (MACC). 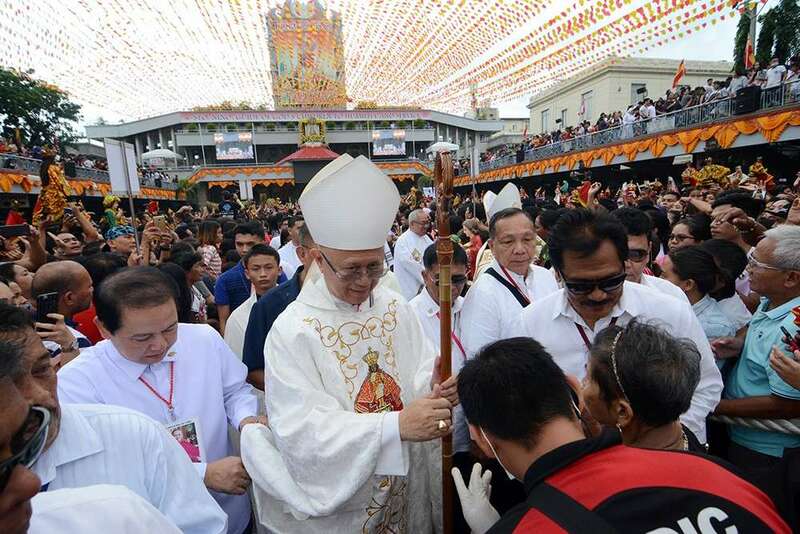 The 68-year-old prelate also thanked the devotees who braved the sea despite the forecast bad weather and joined the seaborne procession of the blessed images of the Sto. Niño and of Our Lady of Guadalupe along the Mactan Channel on Jan. 19. The Pontifical Mass, which was the mass for the feast and concelebrated by 40 other priests, was spared from the rain brought by the tropical depression Amang. Soledad Postrano, 68, a candle vendor at the basilica for nearly 15 years now, believed that the child Jesus willed the fair weather during the Pontifical Mass. “Gikaluy-an jud tawn ta sa Señor Sto. Niño (The Sto. Niño had mercy on us),” she said. Days before the Sinulog grand parade, officials of the weather bureau warned the devotees of a possible downpour on Jan. 20.